Nowadays, most of the things are easily available in super markets. We just buy them, assemble them at home and enjoy! But, the gratification that we get when we make those things at home cannot be compared even a bit for things that are bought readymade. One such thing in the grocery list of most of our dear ladies are Spring Roll wrappers. Yes, even in my grocery list they always made their way couple of years back until I started making them at home. Trust me, it is very easy to make at home, only few pointers need to be kept in mind, but once you start making and get hold of it, it will become one of the easiest thing to do. And the best thing is you can make them in bulk at once and store it easily for a year, it won’t get spoilt at all. I have explained each step in detail with pictures as well as do’s and don’ts to be kept in mind while preparing the wrappers. 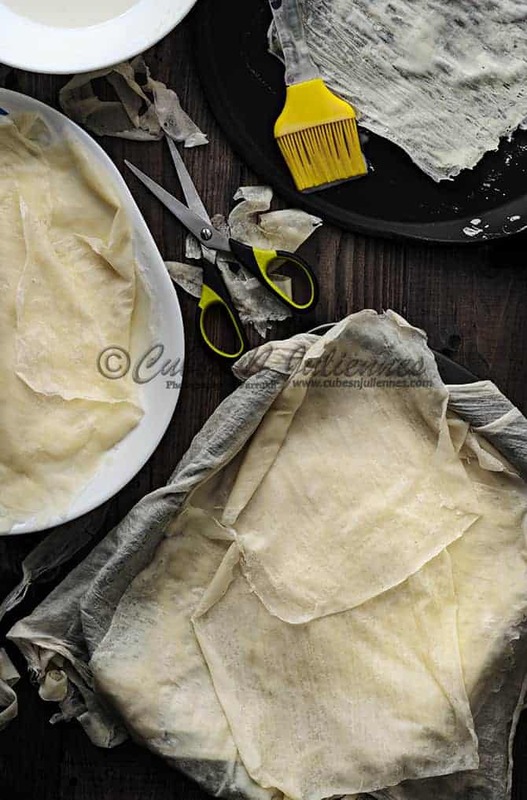 Now, without wasting much time, let’s go through how to make best homemade spring roll wrappers. Now, take a flat non-stick griddle/pan and heat it on gas stove on very low heat. Now, start brushing the batter on the greased pan to make square shape as shown in the image below. 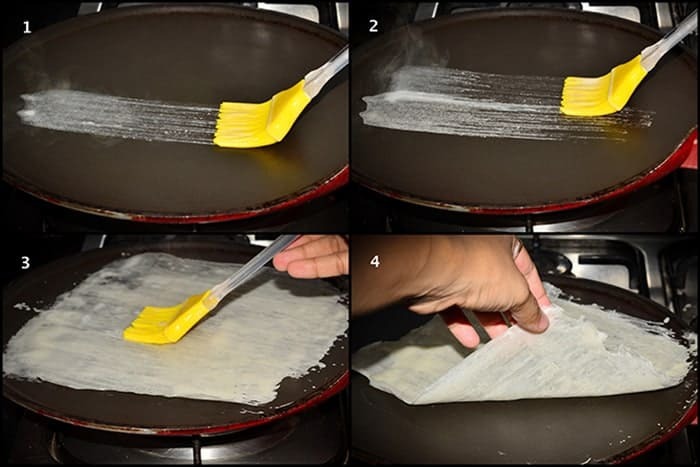 Allow it to cook for few minutes, when wrapper is cooked well, it will start leaving the edges ensuring you to peel of the wrapper from the griddle or take them out using spatula. 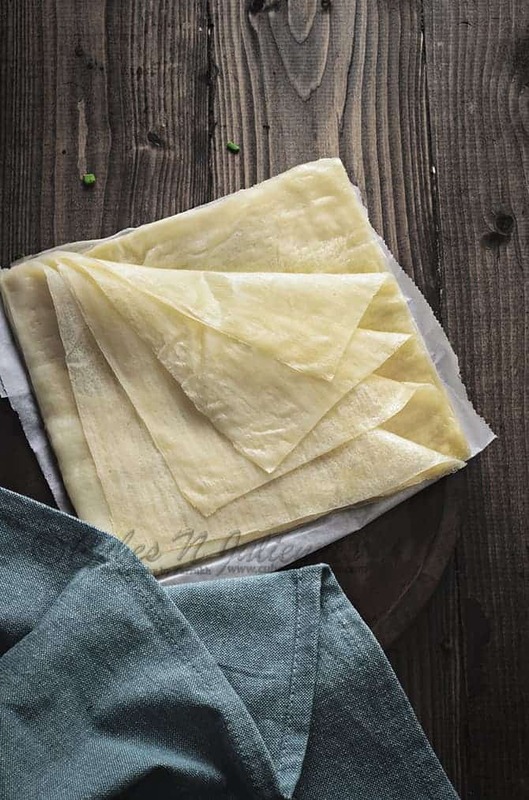 Carefully, take it off the pan and place on the tray, keep it covered with damp kitchen cloth, please do not allow the sheets to come in contact with air or the sheets will get dry. Also, please do not increase the heat, maintain the hotness of the pan at low heat only. Now, clean the griddle, grease it again and proceed with brushing the batter. Repeat the process until done. Once you are done with making all the wrappers, if you wish you can trim the edges and make it smooth square shaped wrappers. Now, to store the wrappers in the freezer, brush each sheet with oil and stack them. Cover with parchment paper and keep it in zip lock. 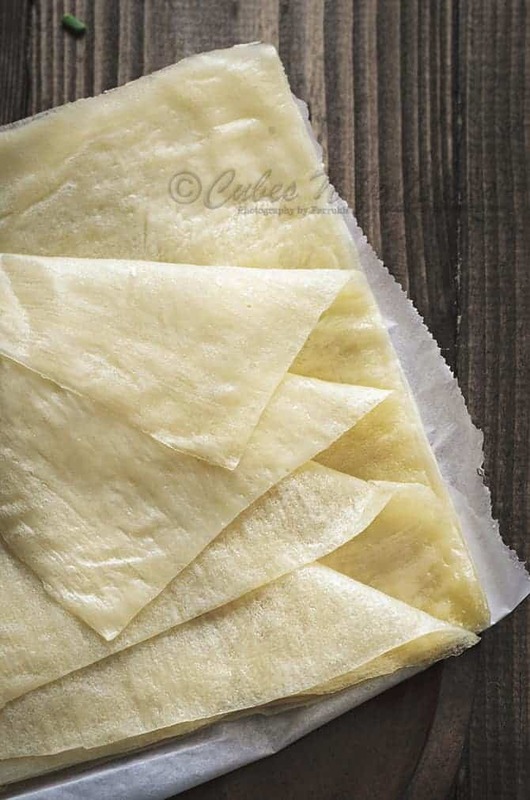 Greasing of sheets will make it easier to separate after thawing. You can store the sheets in batches, this will allow you the easy access to the amount required in one go. Just thaw at room temperature and proceed with making of spring rolls. I am Beyond excited that I found your recipe and instructions. I grew up in a Filipino family and this is how we made our wrappers when I was a kid. I have been looking for the recipe and instructions for over 40 years and I have finally found your instructions. I have bookmarked it and I am going to write them down and put it in the family cookbook before I lose it again thank you for your help I am beyond excited. I can’t wait to make them this weekend.